Kyle Kingson (Alex Pettyfer) is the arrogant and vain son of news anchor Rob Kingson (Peter Krause). Kyle bullies Kendra Hilferty (Mary-Kate Olsen), not knowing she is a witch; she transforms him into a hairless, scarred, heavily-tattooed shell of his former self. If Kyle does not find someone who loves him by the next spring he will stay altered permanently. Kyle is taken to live in a private house with their maid Zola Davies (LisaGay Hamilton) and the blind tutor Will (Neil Patrick Harris). Both are comforts to Kyle when his father, unable to deal with his transformation, has abandoned him. As spring nears, Kyle finds himself infatuated with Lindy Taylor (Vanessa Hudgens), a former classmate he had avoided. He rescues her drug-addicted father from two dealers, shooting one; the other vows to kill Lindy. Kyle persuades Lindy's father to allow her to move in with him. At first, Kyle uses a false identity, refuses to see Lindy, and hides from her, which angers her to the point that she stops speaking to him. Kyle eventually reveals his face and the two begin to warm up to each other. Kyle writes a letter professing his love for Lindy but does not give it to her for fear of rejection. He visits Kendra to plead for more time; she refuses, but agrees to restore Will's vision and grant green cards to Zola's three children in Jamaica if he gets Lindy to fall in love with him. The surviving drug dealer lands in jail. Kyle and Lindy visit Lindy's hospitalized father. He gives her the letter but regrets it when she tells him she considers him a good friend. Lindy calls him after reading the letter, but a heartbroken Kyle does not answer the phone. Persuaded by Will and Zola, Kyle goes to meet Lindy one last time before she leaves on a school trip to Machu Picchu. Kyle tells her to go, but as she leaves, Lindy tells him that she loves him, breaking the curse. Kyle's former self is restored but Lindy does not recognize him and tries to call Hunter but Kyle's phone rings instead. When Lindy realizes what happened, the two share a passionate kiss on the side of the street. After the curse is lifted Will wakes up with the ability to see, and Zola receives the green cards. Kendra approaches Rob Kingson's office as a new intern, implying that she will test Rob like she did Kyle. There was an alternate ending that was filmed where Lindy gets kidnapped by the drug dealer and in the process Kyle gets shot. As he lays injured in his arms she confesses her love to him, breaking the curse in a fashion more closely based on the book and the original Beauty and the Beast story. This ending was not used in the official release however it was used in the official video game on the Wii. Baer expressed excitement about the director, saying, "Daniel's fresh vision makes him one of the most exciting directors of his generation. We are thrilled to partner with him as he brings his unique voice to arguably the most universally resonant myth in storytelling." Barnz anticipated bringing an indie sensibility to Flinn's story. "It's a very commercial idea that I get to tell in a highly artistic fashion," he said. Barnz also said; "There was this sort of hyper-modern version of this story and that it was told from his perspective, which we'd never seen before and thematically, because it's all about beauty and how you look and inner beauty that this was such a great story set in the teenage world and for teenagers, because it has such a great message to it". CBS Films announced that clothing and accessories, social expressions and games would be produced to market the film. Among the products were proprietary and co-branded games and puzzles by Fundex; figures and bobbleheads worldwide by Bif Bang Pow! ; costumes, masks and accessories for the US and Canada from Rubie's; and video games worldwide from Storm City. Alliance Films, based in Montreal, released the film in Canada under a deal with CBS Films. Sony Pictures handled international distribution. The first planned release date was July 30, 2010, but a few weeks after Charlie St. Cloud moved to a July 30 release, CBS films released a statement through Beastly's official Facebook page. CBS films would delay the release of Beastly because it would cause a "real dilemma" to fans of Zac Efron and Vanessa Hudgens' relationship. The film's new release date was March 18, 2011 to avoid clashing with films opening during summer 2010. However, the new date was four weeks after Pettyfer debuted in American cinema in I Am Number Four, and three weeks before the release of Hudgens' other film Sucker Punch. CBS Films distribution head Steven Friedlandere said, "There wasn't much left in the summer that we could move it to. We didn't want to go in fall, and the holidays are for four-quadrant movies. So we figured if we went to March, we'd have some school breaks happening around that time." After a successful test screening, CBS Films decided on an earlier release date, March 4, 2011. The movie was released on Blu-ray Disc on June 28, 2011. Beastly received mostly negative reviews, earning a 20% approval rating from Rotten Tomatoes from 92 reviews, with an average rating of 3.7/10. The critical consensus read "Fundamentally misguided, poorly written, and badly acted, Beastly adds little to the legacy of its timeless source material." Adam Markovitz gave it a D- in Entertainment Weekly, commenting, "Spectacularly poor judgment in everything from acting to costuming (Olsen's Harajuku-troll get-up is scarier than her curse) puts Beastly right on the cusp of the so-bad-it's-good Hall of Shame." Lou Lumenick of the New York Post said the film " more than lives up to its name with ultra-campy performances, high-glucose direction (Daniel Barnz), laughable dialogue, cheesy effects and a back-lot simulation of a Manhattan street that wouldn't pass muster on an after-school special." Mick LaSalle of the San Francisco Chronicle, while noting problems with the plot and script, argued that these problems were largely acceptable within the confines of the genre, and were alleviated by the charm of the actors and the direction. He remarked that Barnz "showed imagination and sensitivity in his feature Phoebe in Wonderland and hasn't lost those qualities now that he's entered the world of the big budgets." Claudia Puig wrote in USA Today that "This modern reworking of Beauty and the Beast has none of the charm of the Disney animated version. It's dogged by awkward dialogue, a ridiculous plot and lackluster performances, especially by the leads ..." A number of reviewers criticized that Kyle did not look genuinely ugly in his beast form, and could even be regarded as more attractive, thereby compromising the film's moral about "inner beauty" shining through physical ugliness. Beastly was ranked number 45 in The Times' predicted "50 Biggest Movies of 2010". The film was screened at ShoWest and it drew enthusiastic reactions from the luncheon crowd of exhibition officials. Beastly had the third largest weekend gross earnings behind Rango and The Adjustment Bureau. As of May 25, Beastly's total US gross is $27.9 million. It garnered $15.3 million more in other regions, making the film's worldwide gross earnings $43.2 million. ^ a b Vincent Brousseau-Pouliot. "Une superproduction hollywoodienne à Montréal". MonCinema. Archived from the original on 2009-07-04. Retrieved July 4, 2009. ^ "CBS FILMS: "A TINY PART OF OUR BUSINESS," SAYS MOONVES". Studio briefing. Retrieved 2010-08-05. ^ "Beastly". Box Office Mojo. Retrieved June 2, 2011. ^ McNary, Dave (2009-04-22). "Vanessa Hudgens to star in 'Beastly'". Variety. Archived from the original on 25 April 2009. Retrieved 2009-05-18. ^ Zeitchik, Steve (2009-02-05). "Barnz to take helm of "Beastly" teen tale". Reuters. Retrieved May 14, 2009. ^ "Daniel Barnz To Direct 'Beastly' for CBS Films". Reuters. 2009-02-05. Archived from the original on 15 June 2009. Retrieved 2009-05-14. ^ a b Graser, Marc; Stewart, Andrew (2010-06-07). "CBS pushes back 'Beastly'". Variety. Reed Business Information. Retrieved 2010-06-08. ^ "Barnz to take helm of 'Beastly' teen tale". 2009-02-05. Archived from the original on February 6, 2009. Retrieved 2009-05-26. ^ "Vanessa Hudgens New Man Is 'Beastly' Alex Pettyfer". 2009-04-29. Archived from the original on 2009-05-02. Retrieved 2009-05-26. ^ a b c d Ellwood, Gregory (2009-10-28). "A 'Beastly' and challenging transformation for Alex Pettyfer". Hitflix. Archived from the original on 2009-11-01. Retrieved 2009-10-29. ^ Jocelyn Vena (2009-04-23). "Vanessa Hudgens Gets 'Beastly' Role". Archived from the original on 26 April 2009. Retrieved 2009-05-26. ^ Kelly, Brendan (2009-08-17). "Vanessa Hudgens graduates". The Montreal Gazette. Archived from the original on August 20, 2009. Retrieved 2009-08-23. ^ "Vanessa Hudgens Gets 'Beastly'". Entertainment Online. Archived from the original on 25 May 2009. Retrieved 2009-06-07. ^ Carroll, Larry (2010-04-28). "Vanessa Hudgens Says She's No Beauty In 'Beastly'". MTV. Archived from the original on 30 April 2010. Retrieved 2010-04-28. ^ Maria Gonzalez (2009-06-04). "Mary-Kate Olsen meets Vanessa Hudgens in 'Beastly'". Archived from the original on 7 June 2009. Retrieved 2009-06-05. ^ a b (June 3, 2009) Mcnary, Dave (2009-06-03). "Olsen, Pettyfer to get 'Beastly'". Variety. Archived from the original on 8 June 2009. Retrieved June 4, 2009. ^ Billington, Alex (2009-06-07). "Neil Patrick Harris Books Two More Feature Film Roles". First Showing. Archived from the original on 10 June 2009. Retrieved 2009-06-08. ^ Carroll, Larry (2010-04-06). "Neil Patrick Harris Dishes On 'Stylish And Sleek' Film 'Beastly'". MTV. Archived from the original on 10 April 2010. Retrieved 2010-04-07. ^ "Lisa Gay Hamilton lands role in gothic romance film". July 14, 2009. Retrieved 2009-07-15. ^ Fleming, Michael (July 6, 2009). "Peter Krause boosting 'Beastly'". Variety. Retrieved July 7, 2009. ^ a b c Ellwood, Gregory (2009-08-13). "A visit with Vanessa Hudgens on the set of 'Beastly'". Hit Flix. Retrieved 2009-08-16. ^ Jeremy Kay (2009-02-06). "Barnz signs on to direct edgy romance Beastly for CBS Films". Archived from the original on 24 May 2009. Retrieved 2009-05-13. ^ a b Zeitchik, Steven (2009-02-04). "CBS Films finds helmer for 'Beastly' thrills". The Hollywood Reporter. Archived from the original on February 28, 2009. Retrieved 2009-05-14. ^ "Daniel Barnz to Direct "Beastly" for CBS Films". 2009-02-09. Archived from the original on 24 May 2009. Retrieved 2009-05-14. ^ Jarrod Sarafin (2007-12-05). "CBS Films take on Beastly". Archived from the original on 2009-03-01. Retrieved 2009-05-13. ^ a b Edward Douglas (2009-08-12). "An Exclusive Sneak Peek at Beastly". ComingSoon. Retrieved 2009-08-13. ^ Baker, Lynn (2009-08-12). "We're on the set of "Beastly"!". Retrieved 2009-08-24. ^ McGurk, Stuart (2009-05-22). "Alex Pettyfer: I f*** more than a rabbit". The London Paper. Archived from the original on 2009-05-25. Retrieved 2009-05-24. ^ Schwartz, Terri (2010-04-17). "'Beastly' EXCLUSIVE: New Still Takes Vanessa Hudgens And Alex Pettyfer To The Zoo". MTV. Archived from the original on 18 April 2010. Retrieved 2010-04-17. ^ Barker, Lynn (2009-10-26). "Alex Pettyfer: Tidbits from the "Beast"". Archived from the original on 29 October 2009. Retrieved 2009-10-28. ^ Martin, Lara (2009-08-07). "Hudgens "freaked out" by co-star Pettyfer". Retrieved 2009-08-16. ^ Idelson, Karen (2009-09-11). "Quebec takes pride in production". Variety. Retrieved 2009-09-13. ^ Edward Douglas (2011-01-21). "Beastly: An Exclusive Set Visit". ComingSoon. Retrieved 2011-01-22. ^ Anabelle Nicoud (2009-05-12). "Vanessa Hudgens : la belle à Montréal". Archived from the original on 2009-05-15. Retrieved 2009-05-17. ^ Kelly, Brendan. "Never fear - Phantom's here". The Montreal Gazette. Archived from the original on 24 May 2009. Retrieved 2009-05-17. ^ Carter, Kelley L. (2009-05-31). "MTV Movie Awards celebrates the fun side of filmdom". USA Today. Retrieved 2009-06-01. ^ Shuyee Lee (2009-06-04). ""Beastly" star apartment hunting in Old Montreal". Archived from the original on 15 June 2009. Retrieved 2009-06-13. ^ Brendan Kelly (2009-06-08). "Beastly business". Montreal Gazette. Archived from the original on 12 June 2009. Retrieved 2009-06-13. ^ Ellen Gamerman (2009-06-05). "Actor Neil Patrick Harris on Hosting the 2009 Tony AWARDS". The Wall Street Journal. Archived from the original on 8 June 2009. Retrieved 2009-06-06. ^ "Interview: Vanessa Hudgens Can't Stop the Music". Retrieved 2009-07-29. ^ "Zac Efron And Vanessa Hudgens Call Release-Date Shuffle 'Disappointing'". Archived from the original on 22 July 2010. Retrieved 2010-07-20. ^ Kaufman, Amy (2011-03-03). "Movie Projector: 'Rango' expected to shoot down the competition". Los Angeles Times. Tribune Company. Archived from the original on 5 March 2011. Retrieved 2011-03-03. ^ "The Scoreboard". MovieScore Magazine. Archived from the original on 2010-03-24. Retrieved 2010-03-29. ^ "Marching Band In The Studio Working On New Album". Plugin Music. 2009-12-18. Retrieved 2009-12-19. ^ "Beastly :Music". Amazon.com. 2011-01-04. Retrieved 2010-05-11. ^ Rich, Katey (2009-11-23). "Teaser Trailer: Beastly". Cinemablend. Archived from the original on 24 November 2009. Retrieved 2009-11-24. ^ Fisher, Russ (2009-11-23). "Beastly Movie Teaser: Like Jean Cocteau Via the CW…or Worse?". /Film. Archived from the original on 26 November 2009. Retrieved 2009-11-27. ^ Barrett, Annie (2009-11-23). "'Beastly' teaser trailer: I expected more hair". Entertainment Weekly. Archived from the original on 28 November 2009. Retrieved 2009-11-27. ^ Mr. Disgusting (2010-04-01). "Good vs Evil Personified in 'Beastly' One Sheet". Bloody Disgusting. Archived from the original on 4 April 2010. Retrieved 2010-04-14. ^ Bierly, Mandi (2010-02-25). "'Beastly' footage: Hey, at least he still has those abs". Entertainment Weekly. Retrieved 2010-04-14. ^ Buchanan, Kyle (2010-04-19). "Beastly Trailer: Mary-Kate Olsen is the Littlest Witch". Movieline. Retrieved 2010-04-20. ^ Wilensky, Dawn (2009-06-16). "CBS Scripts Licensing Model". Brandweek. Archived from the original on 2009-06-20. Retrieved 2009-06-19. ^ "Show Buzz: Toy Fair 2010". Play Things. Archived from the original on 2010-02-22. Retrieved 2010-02-18. ^ Kelly, Brendan (2009-12-01). "CBS Films makes Alliance". Variety. Retrieved 2009-12-03. ^ "Sony Inks International Distribution Deal with CBS Films". Movieweb. 2009-11-18. Retrieved 2009-11-23. ^ "Hudgens' Beastly Moved Away From Efron's St. Cloud". Comingsoon. 2010-05-25. Archived from the original on 29 May 2010. Retrieved 2010-05-26. ^ Brevet, Brad (2010-05-25). "Celebrity Relationships Now Deciding Film Release Dates?". Rope of Silicon. Archived from the original on 28 May 2010. Retrieved 2010-05-26. ^ Frankel, Daniel (2010-06-08). "CBS Films: What, Me Worry?". The Wrap. Archived from the original on 14 June 2010. Retrieved 2010-06-09. ^ "Beastly (2011)". Rotten Tomatoes. Retrieved 6 April 2018. ^ Markovitz, Adam (March 8, 2011). "Beastly". Entertainment Weekly. Retrieved 6 April 2018. ^ a b Lumenick, Lou (March 4, 2011). "'Beastly' Ghastly as Well". New York Post. Retrieved 6 April 2018. ^ a b LaSalle, Mick (March 4, 2011). 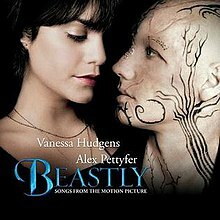 "'Beastly' Review: Can she Unlock his Inner Beauty?". San Francisco Chronicle. Retrieved 6 April 2018. ^ a b Puig, Claudia (March 6, 2011). "'Beastly' is an ugly retelling of fairy tale". USA Today. Retrieved 6 April 2018. ^ Moran, Michael (2009-10-26). "The 50 Biggest Movies Of 2010". The Times. London. Retrieved 2009-10-27. ^ Frankel, Daniel (2010-03-18). "At Last, CBS Films Generates Some Heat". The Wrap. Archived from the original on 22 March 2010. Retrieved 2010-03-19. ^ Joyce, Colleen (2010-04-03). "CBS Films Presents Beastly (Movie Poster, ShoWest Details, & More!)". The Wrap. Archived from the original on 2010-04-08. Retrieved 2010-04-05. ^ "'Beastly' Stars Vanessa Hudgens and Alex Pettyfer Named Stars of Tomorrow at ShoWest". MTV. Retrieved 2010-02-14.